Ever try grinding a rail on a skateboard? It is as hard as it looks. But not as hard as grinding one without a board. Despite this a surprising number of characters are able to do just that. Harnessing the power of gravity to surf down well placed rails at high speed like a makeshift roller coaster, rail grinding allows a character to move faster than their normal running speed though only in the direction of the rail possibly serving as a shortcut between areas. Sometimes they don't even need a rail, they can grind just as well down any slope. Extra style points for shooting at the same time. Named after the equipment from Ratchet & Clank that allows the main character to grind rails. Full Metal Panic! does this in the episode "The Rising Wind In The Homeland, Part 2", with Humongous Mecha discharging oversized shotguns while sliding freely down a steep hill. An episode of InuYasha features InuYasha and Miroku rushing to the aid of the populace by sliding down a grassy hill. Lady Alvida of One Piece can do this, thanks to her Devil Fruit powers granting her body/clothing zero surface friction. Chev Chelios in Crank: High Voltage attempted this, but failed while crushing his balls. In Daredevil, a young Matt Murdock does this after mastering getting around while blind. Ratchet & Clank has the trope-naming Grind Boots. 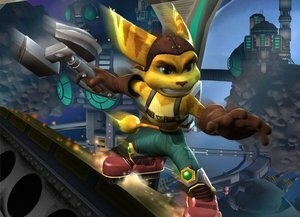 Ratchet has to buy them in the original game, and they allow him to... grind! Generally, rail grinding segments include things to hit and jump over, and some jumps between rails. Uniquely, these boots are one of the few things in the series to mostly avert Bag of Spilling, the other being the Swingshot. 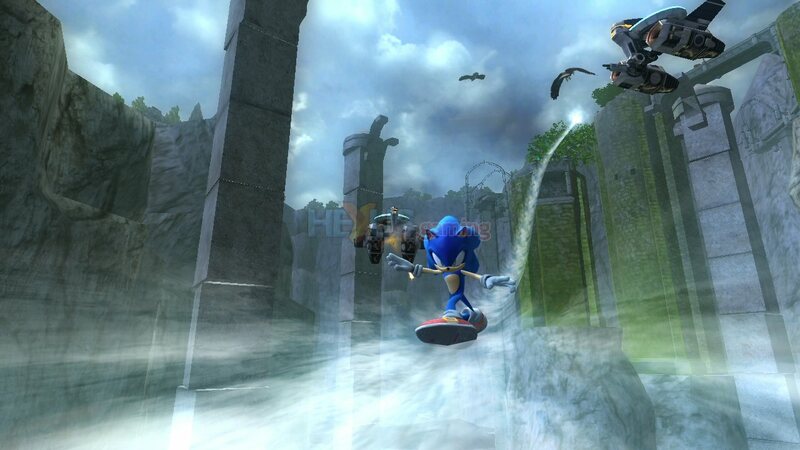 The below mentioned Soap Shoes were featured in Sonic Adventure 2 in order to introduce rail sliding to the series. Although the games no longer feature the brand (due to the bankruptcy of the original company), the rail grinding has remained. Originally only Sonic and Shadow (as well as Amy and Metal Sonic in multiplayer) could grind. Now anyone can grind, even those without shoes, like Big (who wears sandals instead) and Omega (who's a robot, and thus has no need for clothes). In other words, in the world of Sonic, people really, really like Soap Shoes. Sonic Heroes feature grinding as part of the gameplay. It's pretty noticeable how the rails magnetically attracts any characters who have their shoes close to the rails. Miss, and oblivion awaits. A level in Gunstar Heroes has the player(s) sliding at high speed down a hill, fighting off sliding bad guys all the while. In the video game Psychonauts, the main character, Raz, can grind on anything — branches, ropes, wires, monorail tracks, wooden rails, tables, and probably your nose. It's handwaved by him being raised in a circus. Once Raz starts his grind, he won't stop until he reaches the end of whatever he's grinding on, or he jumps off. You can literally be going at a snail's pace and the game will still play the grinding noise and have splinters of wood fly out from behind his shoes. You can even switch directions mid-grind and move back up the rail you just grinded down. In Final Fantasy X, most of the party dramatically grinds down the mooring-cables of your Global Airship to rescue Yuna from being forcibly married to a villain. The clip follows the path of The Hero, Tidus, and focuses on the sparks flying off of his shoes and his coordination to jump between the crossing ropes in midair. What it doesn't focus on is Kimahri doing the same thing while barefoot/pawed and carrying Lulu, the next tallest party member. Yuna can do her own on a chain under Bevelle in Final Fantasy X-2. Presumably her party members do too, but we don't see them. Characters in Jet Set Radio employ grind boots capable of grinding anything even if it goes directly up. Sly Cooper learns the Rail Slide technique after Episode 2 of the first game. The third game takes it even further with Laser Rail Slide. Bloodrayne can do it on most railing, but it's probably just a standard Lesbian-Nazi-Hunting-Ninja-Vampire power in that world. In an evening gown, without mussing her hair. Can't top that. The eponymous TY the Tasmanian Tiger can grind on rails and ropes. Bare pawed. This is a crucial ability in the Tribes series. In the first game, it was simply a glitch that allowed you to grind at superspeeds down any slope steep enough. In the second game, they refined it to be accessible to players with less practice, and in the third it was such an official feature that it has its own appearance and animation, and can be done on horizontal surfaces. It's called skiing, though. Nearly all of Dissidia: Final Fantasy's stages all have "grind bars" of some sort. What they look like depends on what stage you're on, the can be arcs of light, walls, stone ridges, or the freaking Lifestream itself!. In Scaler, Scaler can grind bare-clawed on rails. However, grinding plays a bit of an important role, as it is the only way for Scaler to charge up energy, which can then be used in an electric attack. When Sora visits Deep Jungle in the first Kingdom Hearts, there's a minigame where he and Tarzan go tree-surfing. To make this even weirder, if you make the right turns you can end up sliding through a cave. Kingdom Hearts 3D: Dream Drop Distance has this as a regular feature. The series being what it is, there's nothing forcing you to grind in the direction of gravity, and indeed can use the feature to go straight up. Also one of the main features in Sunset Overdrive. It can be done with any kind of footwear too, even bare feet. In John Woo's Stranglehold Detective Tequila is able to grind down rails while shooting enemies in slow motion. In inFamous, Cole can grind on any electrically charged surface, including power lines and electric train rails. Kid Icarus: Uprising features several segments, during the on-foot portions of the game, wherein Pit grinds on rails made of light. No special footwear required; he gets by with his standard sandals. They happen to be gifts from Palutena and later Viridi, and on one occassion Hades , and can only be seen, much less ridden, by Pit. Used in Darken during The Race. Featured as part of the Agility Trials in Last Res0rt, when Daisy tries to grind using her Artificial Leg. It doesn't end well. In The Legend of Korra, metalbender police officers sometimes use this during chases. Considering the nature of their powers, it's completely justified. Cyborg from the Teen Titans also demonstrates this ability in the episode "A Date With Destiny". Sliding down the cables of a bridge while shooting his Arm Cannon — Booya! The Disney Tarzan movie, and the George of the Jungle movies. Batman, Nightwing and the Red Hood all do this in a chase scene in Batman: Under the Red Hood. Static Shock employs a flying disc to travel around, but when he meets similarly powered veteran superhero Soul Power, he learns to use his powers to grind power lines to travel around. Many inline skates designed for aggressive skating have plastic plates used for down handrails like a skateboard. The infamous Soap Shoes are essentially regular sneakers with grind plates similar to rollerblades. Some sneakers have insoles made of hard plastic. This invocation is usually one-footed and unintentional.